Have you ever wonder how the Swans did on a particular date in history or wondered which league or competition they played in? Well now you can find out exactly what happened when the boys in black and white played on 23rd December. 3 years ago on 23 December 2012 – A goal from Michu helped the Swans grab a 1-1 draw with Premier League leaders Manchester United at the Liberty Stadium. The 20,650 crowd were treated to gutsy performance from Michael Laudrup’s men as they frustrated Sir Alex Ferguson’s team throughout the game. 9 years ago on 23 December 2006 – A last minute equaliser from Adebayo Akinfenwa saved the Swans from defeat as they drew 1-1 with Rotherham United at the Liberty Stadium in Coca-Cola League One. The 12,327 crown went home happy though as the point earned saw the Swans move up to 5th place in the table. 15 years ago on 23 December 2000 – The second from bottom Swans suffered a 2-1 defeat at Wycombe Wanderers in Nationwide League Division Two. 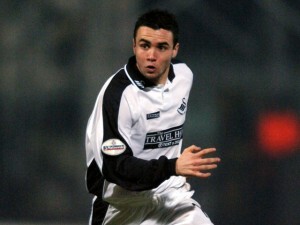 Stuart Roberts got the only Swans goal as John Hollin’s side extended their winless streak to 11 league games. 37 years ago on 23 December 1978 – The Swans lost 3 nil at Shrewsbury Town in a first v second Football League Third Division clash. A record league gate for the season of 8,567 turned up at a snow covered Gay Meadow to see John Toshack’s table topping Swans. 43 years ago on 23 December 1972 – York City handed the Swans their 9th away defeat in the league with a 3 nil win at Bootham Crescent.